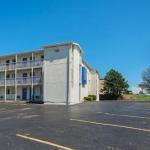 Conveniently located off Interstate 70 this Blue Springs Missouri motel is just 11 miles from Arrowhead Stadium and Kauffman Stadium. Free Wi-Fi is offered throughout the property and in each guest room. A microwave and refrigerator are provided in every room at Nights Inn Blue Springs. Cable TV and a hairdryer are also included. Free coffee is served 24 hours a day at Blue Springs Nights Inn. Fax and photocopying services are available along with free parking. Entertainment at the Sprint Center can be reached in 20 minutesâ?? drive. Kansas City International Airport is 29 miles away.